Hey babes, are you okay? 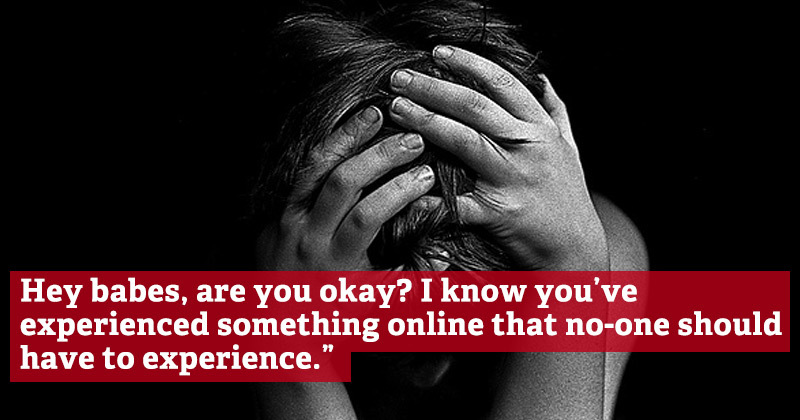 I know you’ve experienced something online that no-one should have to experience. You didn’t deserve to experience what happened. I understand you read someone giving an opinion you didn’t agree with? DM me if you need to speak. I’m writing this open letter to help you and others who may have suffered the horrific experience of seeing people who have different opinions to them. First of all I want to say this: you are a proud and beautiful person. You are a fifty-four year old man who wears a Marks and Spencers suit, who works in an office 9 to 5 and who just wants to come home and microwave a meal from Tesco Metro. You are beautiful. Do you know that hun? How did it feel when you read someone giving an opinion that was different to yours? Must have been awful, hun. You were very brave to even do it. I don’t think I could have read the words of someone approaching a topic from a slightly different angle to me. But you did it. And it must have been hard. I’m in bits thinking about it. You must be in pieces too, hun? …like that time someone said something that was less than 100% adulatory about the politician you like? …or that time in nursery school when everyone wanted to play in the wendy house but you wanted to do painting? …or that time your friends wanted to go Burger King but you wanted to get Nandos? You was fewmin babes, wasn’t you? But you got through it – and you’ll get through this hun. Because you are a beautiful fifty-four year old man who eats scotch eggs and spends time on the motorway driving to various work-related conferences. Don’t forget that you shine like a diamond. What a horrible thing to happen to you though hun? You were completely going about your own business – telling people who to vote for, how to live their lives and that they were all stupid and then BAM – it happened – you saw an opinion that was different to yours? No-one should have to see that. I hear the doctors are saying ever since you heard another opinion it’s been touch and go? That your spirit is ebbing and you are surrounded by candles? That you may never recover? Well I know your angels are watching over you babes, just like they watch over you when you get four sausage rolls from Greggs and some tins of lager to drink in front of the TV at night. You’re beautiful babes, do you know that? And you will get through this. Right now you need to surround yourself with opinions you agree with one day at a time. And I promise you – it will get better hun. We need echo rangers to patrol the echo chambers to make sure this never happens again. Any deviant views need to be aggressively stamped out by online opinion minions. People need to learn that there will be a high price tag if you create trouble in the bubble. Because what happened to you cannot be allowed to happen to anyone else. I believe in democracy as much as the next person – but when we have lots of different opinions flying around something has clearly gone wrong? Lee Kern is a comedian and writer. Read last week’s column about who is to blame for the world being in such a state.